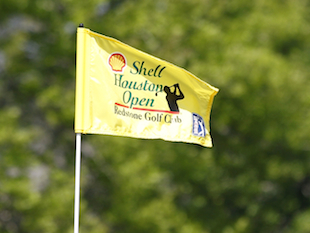 When the rain came and put a stop to round one of the Shell Houston Open on Thursday, things for Michael Thompson looked pretty much just like the weather: dark and gloomy. He was sitting at 3 over par through 17 holes of his first round. It was clear, even on Thursday, that the cut for the tournament was most likely going to fall at two under par. That meant that if Michael was going to keep his cuts made streak alive, he was going to have to play some outstanding golf over the next nineteen holes. Luckily for Michael, the sun came out and his game heated up. Michael started his day early as he played hole #18 of his first round at 7:30am local time. The hole is the most difficult on the course and Michael played it well giving himself a reasonable 13 foot birdie chance which didn't drop but left him a tap in par. Then Michael got to wait until his late second round tee time which was 6:10pm local time. Michael didn't waste any time making his move up the leaderboard. He birdied two of his first three holes and only missed birdieing all three holes by 6 inches. Michael's day came to an end when darkness fell as he is sitting over a 6 foot birdie putt on hole #15. If Michael can convert the birdie putt, he will be three under for the second round and just two shots from the cut line. He still has some work to do over the next 12 holes but things look a lot brighter today than they did yesterday. The second round will resume at 7:30am local time. 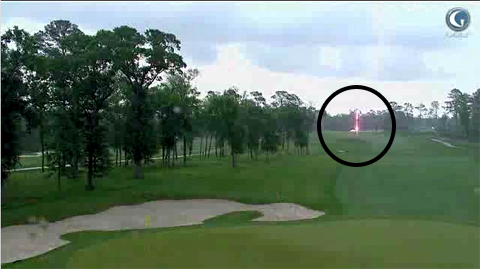 During round one of the Shell Houston Open, the skies opened up and put an end to round one for the day when both lightning and large amounts of water made the course unplayable. More than half the field had not finished round one and many hadn't even teed off yet. Michael Thompson's day ended before he could tee off on hole #18 - the most difficult on the course. At the time Michael was sitting at 3 over par, well off the pace as he wasn't able to get anything going. But today is a different day. He finished round one with a solid par on the difficult eighteenth hole and now he's waiting for his second round tee time which is currently scheduled for 6:10pm local time. Since the sun will set at 7:39pm he won't be able to finish round two until Saturday morning. Michael will once again be paired with Marco Dawson and Sunghoon Kang. The group is scheduled to start round two at 6:10pm local time from the tenth hole. Round two will be covered on the Golf Channel from 3pm - 6pm ET. Michael Thompson didn't get to finish his first round along with the entire afternoon wave of players. They'll be restarting at 7:30am Friday. Stay tuned to PGATour.com for updated second round tee times. In the last month and a half, Michael Thompson has been playing some good golf out on the PGA Tour. In that time he's made five straight cuts and had two top 20 finishes. In four of those five tournaments, he was playing the event for the first time. The lone exception was the Mayakoba Classic. 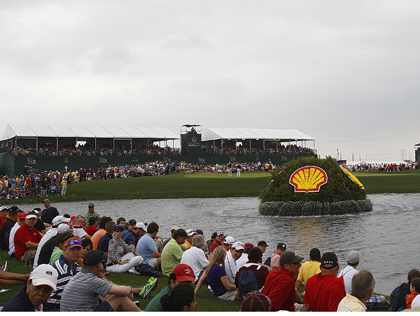 This week, Michael will be playing in the Shell Houston Open where he finished in a tie for 24th last year. For many of the top players in the field, the Shell Houston Open is a warm-up for the Master's which starts next week. For the rest of the field it's the last opportunity to earn a spot in the Master's field with a win. In either case, the course is setup to mimic the conditions at Augusta National as closely as possible. Michael will be paired with Marco Dawson and Sunghoon Kang for the first two rounds. The trio tees off from the first hole at 8:50am local time. Round one will be covered on the Golf Channel from 3pm - 6pm ET. Michael Thompson hit some stellar shots form the sand and made long putts of 37'-3", 25'-2" and 45'-8" to finish the 3rd round at even par for the day, +2 overall. His 45 footer on 15 was the longest putt of the tournament for that hole. The Bay Hill Club & Lodge course was playing tough as less than half the field finished under par, so even par was a really good score. He will be going into the final round tied for 50th. Michael Thompson's steady play has continued, as he scored even par to finish the second round at +2 overall, making it past the cut which was at +3. That's five cuts in a row for Michael and 7 out of 9 for the year. He'll be starting off saturday tied for 47th. Michael will be starting at hole #1 at 12:33 ET with Andrew Magee and Josh Teater. Michael Thompson finished strong at the Transitions Championship at Innisbrook, scoring 4 under on the day, 8 under for the week. He rose 23 spots on the leaderboard to finish T16. For his efforts he earned $85,000 which moved up him up to #59 on the money list ($387,000), #56 on the Fed Ex Cup list, and #92 on the OWGR list. It was his fourth cut in a row that he's made, 6 of 8 for the year. Put all that together, and he's having an awesome year! It seemed to us like this course really suited his game, and we expect him to return and do well in the future. It doesn't favor any one type of player, and rewards those who manage the course well, which Michael did. One perk of playing well and ranking high on all the various lists, is making it into the Inviational tournaments such as this week's Arnold Palmer Invitational at Bay Hill Club & Lodge in Orlando, Florida. It's something I think we'll be seeing more of in the future! After 10 holes in the third round, Michael Thompson looked like he was going to cruise through yet another round with not much excitement. That wasn't meant to be though, as the final 8 holes were a bit of a rollercoaster. 3 birdies along with a single and double bogey made the round turn into an all out battle. In the end, Michael ended up finishing the round at even par. Tied for 39th and only 3 shots back from the top 10, anything is possible with a strong finish on Sunday. Tomorrow's final round will be carried on the Golf Channel from 1:30pm-3:00pm ET and on NBC from 3:00pm-6:00pm on NBC. Michael Thompson's second round at the Transition's Championship was slow and steady. He began the day with seven straight pars. He broke the streak with a long birdie putt on the 17th hole (see the video above) and managed to get to three under par with a couple of more birdies before two bogeys in his final four holes left him at one under par for the day. The one under 70 was good enough to move Michael into a tie for 25th at four under par for the tournament just six shots off the lead. He is well positioned for "moving day" tomorrow. Tomorrow's third round will be carried on the Golf Channel from 1:30pm-3:00pm ET and on NBC from 3:00pm-6:00pm on NBC. Michael Thompson got off to a great start at the Transitions Championship, getting to three under par after just four holes. That's exactly where he finished the round which has him tied for 20th going into the second round tomorrow. His solid round got off to a roaring start, making 17 and 27 foot putts for birdie on his first two holes. Consistent golf followed, as he hit 83% of his greens in regulation. Michael is grouped with Jesper Parnevik and JJ Henry again. Their tee time on friday is at 2:04 ET on hole #10. Fresh off a one week break, Michael Thompson returns to action at the Transitions Championship, held on the Copperhead course at Innisbrook Resort just west of Tampa Bay, Florida. Copperhead rates as one of the tougher courses on the PGA Tour, evidence of which is the trio of holes ominously named "The Snake Pit" (the 16th, 17th and 18th). The current weather forecast calls for light winds and mostly sunny skies with highs in the mid 80's. There's a chance for afternoon thunderstorms on Friday but other than that, it looks like weather won't but an issue this week. Michael will be grouped with Jesper Parnevik and JJ Henry and will tee off from the first hole at 9:19 ET. Michael Thompson battled the tough PGA National Champion Course at the Honda Classic to finish the final round at +3. Due to the inclement weather that delayed the tournament for a couple of hours, the scores were generally high today. Despite shooting over par, Michael still advanced his position on the leaderboard 5 spots to finish T-47. Earning just over $14,000 for his efforts, he's reached the $300,000 mark for the season. For comparison, at this point last year he had earned approximately $28,000. Michael's success on the PGA Tour is also reflected in his ranking on the Official World Golf Ranking (OWGR). We are pleased to report that for the first time, Michael has cracked the top 100 on the OWGR list, coming in at No. 99! Congratulations to OWGR No. 99, Michael Thompson! For the first two rounds of the Honda Classic, scores had been significantly lower than normal. In fact, the course record was tied three times and then is was shattered by Brian Harmon (by three shots). In response to the lower scores, the PGA picked some rather difficult pin placements for Saturday's third round. Combine that with windier conditions and the scores on Saturday weren't nearly as low. Michael Thompson managed to shoot a two over par 72 for the third round which dropped him 10 spots into a a tie for 52nd. He carded two birdies. two bogeys and a double bogey. He played the Bear Trap (holes 15 through 17) with three solid pars and has played those three holes at even par for the tournament. Bad weather is expected to drastically change the way the PGA National Championship course plays for the final round. The wind has changed directions from the previous three rounds by 180 degrees and gusts up to 30mph are forecast. In addition to the wind, thunderstorms are also expected starting around noon ET. In effort to make sure the tournament will be able to finish on Sunday, the PGA has moved up all of the tee times for the fourth round by combining groups into threesomes and starting from both the first and tenth tees simultaneously. Michael will tee off from the tenth hole at 9:20am with Jason Bohn and William McGirt. The fourth round television coverage will be similar to today's with both the Golf Channel and NBC carrying feeds. Due to the earlier than projected start times, the NBC coverage might be tape delayed. The Golf Channel will carry traditional coverage for a couple of hours before they switch to their "Bear Trap" coverage from 3p ET - 6p ET. After the first round of the Honda Classic, Michael Thompson sat at 126th. Today, however was a new day and Michael came back with a vengeance. He hit 9 of 14 fairways and was making some nice long putts. None were more important than on the 18th hole, sitting right at the cut line which was wavering back and forth all day, he sank a 9' birdie putt to secure himself a spot for the weekend. In total, he scored five birdies and finished the day at four under par, which got himself back to even par overall. He vaulted up the leaderboard a total of 84 spots to end the day at T-42. Michael will once again be paired with Rod Pampling. They tee off at 10:03 ET. The Honda Classic will be aired on both NBC and the Golf Channel for the weekend. The two networks will be airing simultaneously although the Golf Channel's covergae will get underway a couple of hours earlier than NBC. 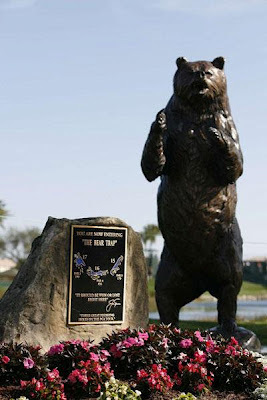 The Golf Channel coverage will feature the "Bear Trap" (holes #15 through #17) and will probably be similar to the Live@ coverage the PGA Tour airs online while the NBC coverage will be the normal network approach to showing featured players and groups. Since the Golf Channel coverage features the holes, rather than a select set of players, you'll get a chance to see some of the guys that don't typically get much air time. 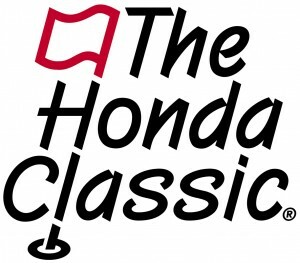 After round one at the Honda Classic, Michael Thomson proclaimed it "the worst day of putting in a year and half" and the end result was a four over par 75 that left Michael in a tie for 126th. Despite the rough day on the greens, Michael also declared that "It's only gonna get better from here!" Michael will once again be paired with Kevin Stadler and Rod Pampling. The trio tees off at 8:10am ET from the tenth hole. The Honda Classic will be aired on the Golf Channel for the first couple of rounds and then will be on NBC for the weekend.